Honey Lime Grilled Chicken - Kosher In The Kitch! 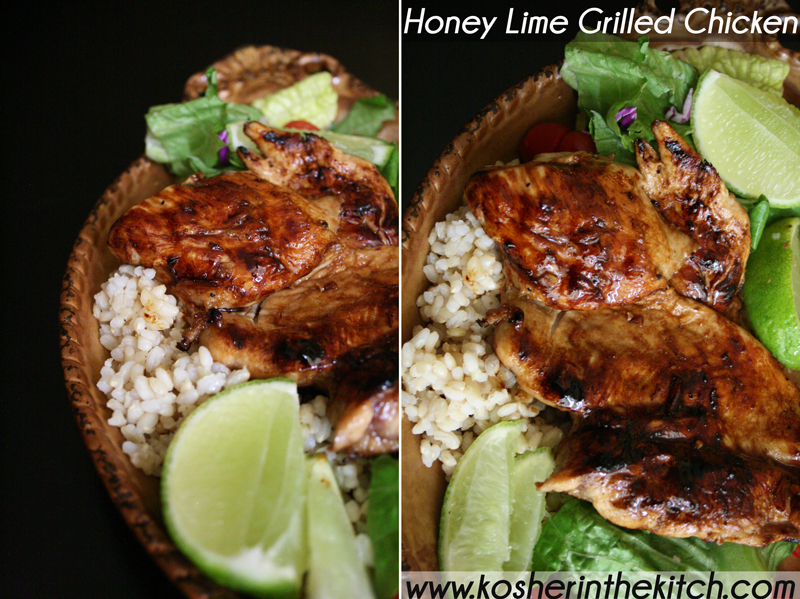 Honey Lime Grilled Chicken - Kosher In The Kitch! Some nights I crave carbs like pizza and pasta. Then there are the nights when all I want is a fresh garden salad topped with juicy slices of perfectly grilled chicken. This marinade blends together some of my favorite ingredients to create a sweetly glazed chicken with a kick of lime. 1 teaspoon Grill Mates® Montreal Steak Seasoning. Combine the olive oil, soy sauce, lime, honey, garlic, ginger and steak seasoning in a large zip lock bag. Place the chicken inside and marinate for several hours. Heat grill pan to medium high and grill chicken for approximately 6 minutes each side, or until juices run clear. Squeeze some fresh lime on top before serving.